driving guitar space rock about low earth orbit, willpower, impatience, social engineering, wet love, secret agents, political freedom and a time to party all wrapped up in 11 songs of human conditioning. richard murrey wrote the title track after the space shuttle columbia disaster giving credit to the bravery and drive of the astronauts who avidly pursue the exploration of space. the song inspired the creative juices of nasa's video/animation team and "l.e.o. ain't high enough" is now the driving beat and sound for a dynamic video promoting the nasa initiative to the moon and mars. the sky's the limit for this song and video... who knows where it will lead? it recently captured a gold addy award at the spacecoast advertising federation's awards ceremony. this most collection of murrey penned originals has a wide variety of styles. lay back in the solid valley of groove and let the songs massage your cortex. "l.e.o. ain't high enough"... low earth orbit just doesn't get it done anymore... all about pushing out to the moon and planets. "will of love"... what used to be a mutual relationship grows into a more "needy", one-sided affair, but there's still optimism! "i can't wait"... ever realize she's more than just a friend and you're tired of seeing her going out with other guys? "can't feel the love"... maybe the "matrix" of this society has us all fooled? maybe we are being sold a lie? perhaps it's all more complicated than it is? "funkyjooze"... ah, the perfect date, the perfect woman... the perfect payoff? "man in the mask"... it's all very hush, hush, secret agent, spy stuff. "livin' simple"... life without all the trappings you work for all your life so you won't have the trappings! huh? "what the blues is for"... oh yeah, when it rains, it pours... and that's the time for the blues. "chain up my heart"... giving up everything for that buzz called love. "blue collar song"... if this nation's great leaders were to pay us a visit now? "partytime"... knock back a few, relax with the groove... it's time to partay. This CD should be number one! The whole CD is one I can put in the player and listen to over and over... truly it's Steely Dan influence, Frank Zappa, Stevie Ray Vaughn, Doors and Santana are all wrapped up in this one. 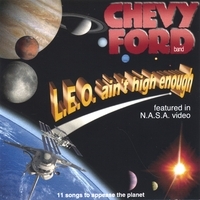 Call me crazy but I'm crazy for the Chevy Ford Band and this LEO CD. Fantastic! We agree that only after disasters do bravery and courage get a boost... we love how you give credit to the astronauts who willingly pursue the exploration of space. since the song inspired the creative juices of nasa's video/animation team we're wondering where besides youtube we could see this. will it be a promo somewhere for NASA? "l.e.o. ain't high enough" is now the driving beat inside our collective heads. the youtube nasa rock video promoting the nasa initiative to the moon and mars is fantastic, with superb sound quality. haunting and scorching is right! guitar work ranging from bluesy, jazzy to shreddy says it well. Kickin it all over the place!!! Even up to low Earth orbit! We really like will of love, right on dudes! the astronauts should really be happy you did an album in their honor. exploration of space is not the only things you've been exploring. where do we see nasa's video? oh found it. on youtube. so your video got a gold addy award at the advertising federation's awards ceremony? kewl beans! these original hits have such a variety of styles. bubba hudson's tremendous vocals and jeff jordan's scorching guitar work ranging from bluesy, jazzy to shreddy is fantastic. Fabulous you guys! take the band's message and lay back in the solid valley of groove and let the songs massage your cortex. I can't wait for you! You guys to be on HDNET! Rumor has it that HDNET is going to use L.E.O. in an upcoming promo! I can't wait! Love this whole CD guys... you shred it! Blue collar is timely and fresh! I would like to see some collaboration with David Byrne on these songs guys, I think your lyrics are very soulful and full of the human experience as are his. Delightful. Great tracks, man in mask, funkyjooz, partytime, LEO... too many to name! all exquisitely done. Why isn't NASA using the L.E.O. song!?!? We just watched the shuttle launch on HD NET the other day and was hoping that L.E.O. would be played. I know NASA is missing a great opportunity - they should be playing this song every launch! excellent, fun and worth it! "l.e.o. ain't high enough" we checked out the video on youtube and this is awesome! Fantastic! This should be on the radio, very marketable in our opinion. "will of love" we enjoyed this, very slow danceable. "i can't wait" this one more uptempo has a great all over appeal. "can't feel the love" island reggae beat, very danceable, slow and groovin’ style and we liked "funkyjooze" we think this is sure funky, groovy and fun! "man in the mask" this should be in next pink panther or Austin powers movie! Haha, great guys, good work! "livin' simple” yes, it is, great lyrics, political and it’s timely. Wonderful tune. "what the blues is for" this is a great soulful blues hit! "chain up my heart" great uptempo rockin song, very danceable. "blue collar song” an island kind of feel, reggae almost swing beat, we love it! This should be on the radio or music video somewhere as it’s quite the hit with us! Fierce! "partytime" great groove and almost a two-step beat. We really like this, bar folks love it. I've been watching HDNET too and would love to see your video there or this song as intro...LEO does have a driving beat and sound, it's got a dynamic video as well, just watched on youtube does a fine job of promoting the NASA initiative to the moon and mars. the sky's the limit for this song and this band! great!